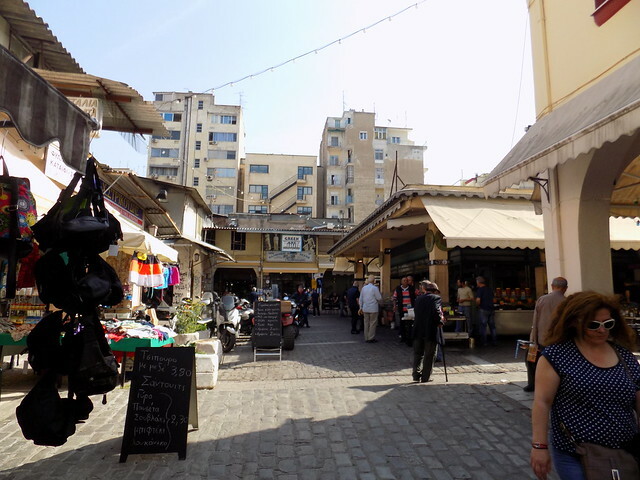 Agora Vlali, or as it is commonly known, Kapani, is an old covered street market located in the center of Thessaloniki, the second largest city in Greece. It lies at the intersection of a confluence of narrow alleyways. 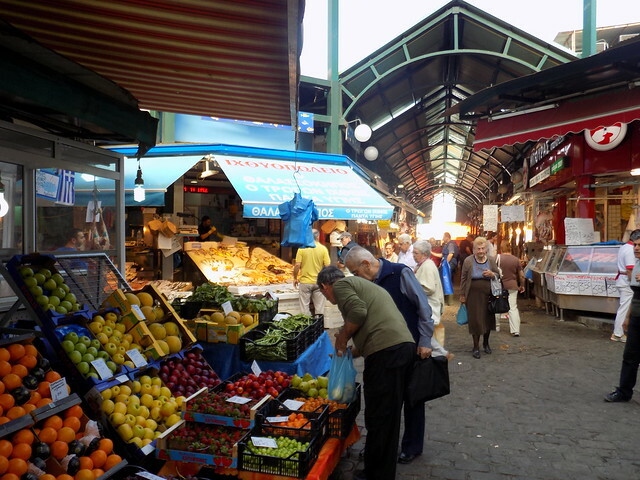 And, is one of the two most central covered street markets in Thessaloniki. It derives its name from the Turkish phrase ”oun-kapan” which means ”flour market”. With an established population of merchants originally from Thessaloniki or nearby areas, to an outsider like me, Kapani appears to be a close-knit community with little space for newcomers. Most of the shops have been there for several years, and judging by the interaction between vendors, there is a strong sense of community and familiarity. People with different accents, can be heard talking to each other about everyday matters: politics, sports, even the quantity of products they received that day. But surprisingly, though Thessaloniki is well-regarded as a multiethnic city, Kapani has no foreign shopkeepers. 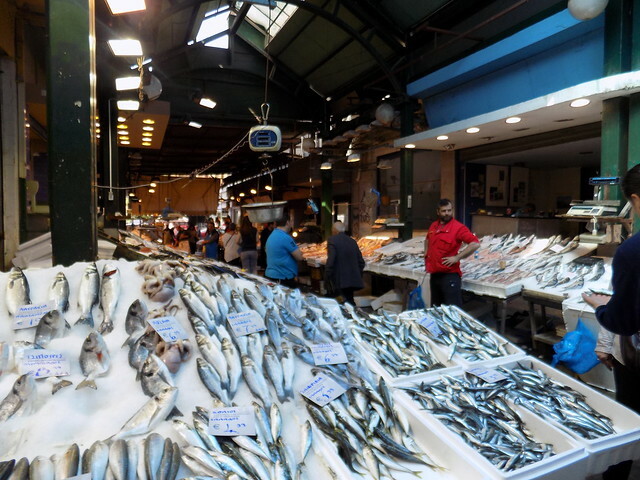 Like the majority of Thessaloniki residents, I have frequented this market for years, stopping in a every few months. It is not massive. But, it is well-stocked enough to cover the basic shopping needs of a household. It’s an easy commute, reachable by public transportation, though inside navigation is possible only by motorcycle, small cars and on foot. Walking through, I heard complaints about parking challenges in the area: it’s increasingly more and more difficult to find a free spot. But more pronounced were conversations about the ongoing financial crisis. This seemed to top concerns and dominates locals’ discussions. I could see customers that seemed well acquainted with the sellers and stopped several times to have a quick chat, but mainly people were in a hurry to shop and leave the crowded market. Anyone who frequents this market knows that the competition between merchants is stiff. This affects the volume and tone of their voices: loud, repetitive and occasionally intimidating. Yet, nobody seemed to be bothered by the loud noises. The vendors’ zealousness to attract buyers, especially those milling about undecided or timidly approaching nearby counters with similar products, was audible and rampant. A few shopkeepers had small televisions inside their shops and many more had radios turned on. Nonetheless, they all seemed eager to start a conversation and draw people in to have a look. At first glance the market seems to be doing alright, but overheard conversations about fewer and more hesitant customers coupled with lower prices seems to confirm that the area has started to succumb to Greece’s broader economic crises. Post and Photos by Eleni Myrtsioti. This is one of many posts where CoLab Radio contributors take readers and listeners on a soundwalk in their city. Read and listen to yesterday’s sound walk from Santa Ana, California here. If you’d like to submit an example from your own city, see the easy steps here.